If the Comcast-Time Warner Cable merger goes through, one company will control way too much of what we see and how we see it online and on cable. A bigger Comcast will also have the power and reach to determine the prices we all pay for cable and Internet service. Indeed, you’re not off the hook even if Comcast doesn’t serve your community; the company will be so huge that it’ll set the agenda for the entire industry. And its vision for the future of cable and the Internet could become the new normal. Comcast doesn’t need to get any bigger: It already owns NBCUniversal, which includes local broadcast stations around the country and some of our nation’s oldest newsrooms and entertainment studios. 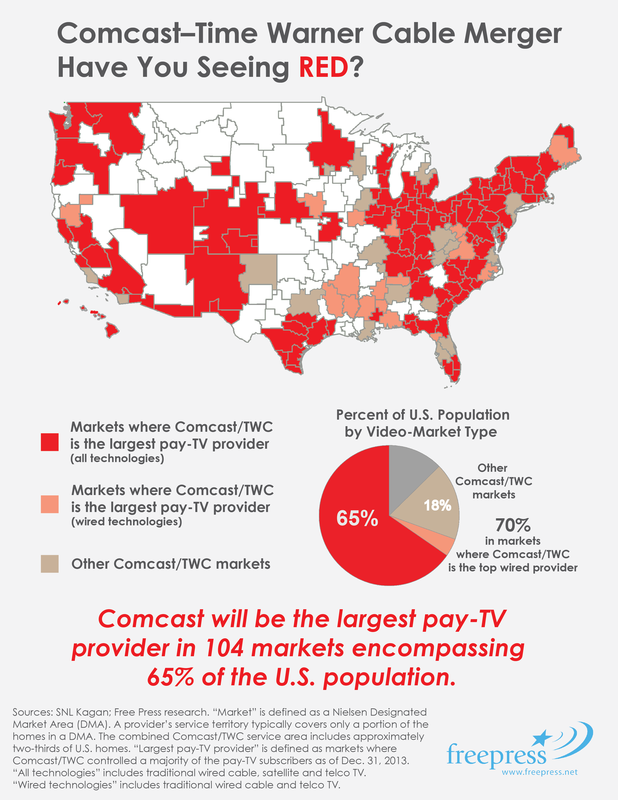 The map below is part of a series of infographics we created from our original research on the impact of Comcast’s proposed takeover of Time Warner Cable. See all four images here and share them with your networks.